One thing Ranelagh isn’t short of is restaurants. From stalwarts like Tribeca, eatery 120 and Mario’s, to newer favourites like the Butcher Grill, Cinnamon and la Bodega, and with Dillinger’s soon to re-open and add to the offering, locals are never short of options for eating out. But one thing that’s been proven with the number of successful new additions there over the past couple of years, is that there’s always appetite for more. 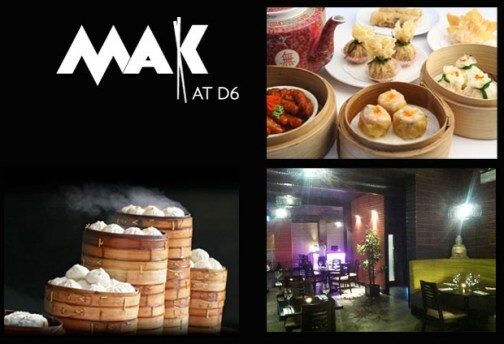 Mak at D6 is located on the Triangle in Ranelagh, between Itsa and the Wine Buff, and I’d been very keen to try its “Dim Sum and authentic Chinese cuisine” offering since I first spotted it opening up a few months ago. Since then, I’ve heard good reports from some local friends who can be trusted about such things. In fact, I’ve become very familiar with the exterior of Mak (I hope it’s OK to call it that, “Mak at D6” is a bit of a mouthful), as I pant past it towards the end of my jog a few times a week. But it was only last weekend that I finally got to familiarise myself with its interior, when Cousin Carol and I hit it up for dinner last Saturday night. It looks a bit canteen-like from outside but once inside, I was pleasantly surprised by the low-lit, modern interior, with windows along one side looking out onto the Triangle, and the kitchen opening onto the other side. We’d booked our table online earlier in the week – while checking out their website I’d been curious to see if their online booking would work, as many restaurants’ websites don’t, but I got a prompt response by email to confirm my booking, and we were seated in a nice spot at the window as soon as we arrived. After too many average takeaways over the years, I don’t really get excited about Chinese food, but I was excited about the prospect of some decent dim sum, specifically the little steamed dumplings that are my absolute favourite. I would have chosen solely from the huge selection on the dim sum menu, which is split into three sections, Steamed, Pan-Grilled, and Crispy, but as Cousin Carol was keen to have a Chinese main course we decided on dim sum to start, to be followed by dishes from the main course menu. I straight away decided on the Prawn Har Gau, which I was excited to see quickly arrive in its little bamboo box, containing four translucent steamed dumplings filled with delicious, fat prawns and bamboo shoots. Easy to divide between two – although I would happily have eaten all four. I also definitely hoovered up more than my fair share of our second starter, the salt & pepper calamari. These were a small plate of lightly coated, salty, crispy squid rings which were absolutely divine, especially washed down with a glass of the suitably chilled Sauv Blanc our cheery Chinese waiter had recommended. We seriously considered ordering a second portion but restrained ourselves at the thought of our main courses. For my main course, I’d chosen pan-fried sea bass (with ginger and coriander oil) over the more expensive black cod dish (a whole tenner in the difference! ), and didn’t regret my decision when I was served two excellent fillets of sea bass, which I teamed with a yummy side order of broccoli with ginger and chili to help myself resist overdosing on the delicious bowls of steamed rice that also accompanied our main courses. Carol was served Mak’s version of that Chinese classic, beef black bean style (€17), and declared it a world away from its gloopy takeaway cousins that have given the dish a bad name over the years. Both dishes came as generous, yet elegantly presented portions, which unfortunately I didn’t get any decent photos of due to the dim lighting (OK, OK, I was too busy chowing down to do much snapping). Having heard a couple of grumbles about slow service here, I can only assume that this was either an early teething problem, or that Mak had also heard the grumbles and addressed them, as I can only say good things about the fast and very attentive service we received from our waiter, who when asked to help us choose between two wines, also recommended the slightly cheaper one rather than default to the more expensive recommendation. I liked this a lot. Every other table seemed to be enjoying a similarly speedy level of service based on the comings-and-goings we could see between the kitchen and the diners. Having taken our table at 8.30pm, we finished up just after ten, and weren’t in any way rushed to leave even though the place had by then completely filled up with Saturday night revellers. Two starters, two mains and a decent bottle of wine came to under €90. Mak are open for lunch every day, and from 5.30 every evening to 11pm on weekend nights. Yes, it’s Chinese at Ranelagh prices, but still represents decent value due to to the quality of the food, service and atmosphere. The next time I go back I’ll be eating just from the Dim Sum menu – the main attraction here as far as I’m concerned. Char sui pork bun, I am coming for you! Mak at D6, The Triangle, Ranelagh. +353 1 406 0006.